In our darkest hours, a radiant display of sunshine is sure to warm hearts, especially when the sunshine is delivered in such a beautiful way. This spray offers an abundance of brilliant yellow blossoms. 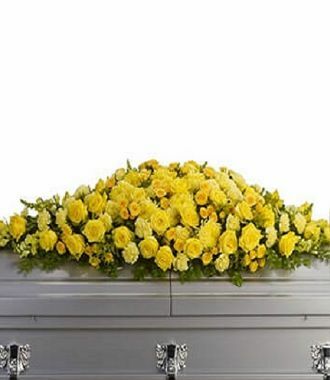 Sunny yellow roses, spray roses, carnations, chrysanthemums, snapdragons and more are arranged in a dazzling full casket spray.